"I based this recipe on one from a famous Virginia colonial tavern, but I've had much better success with this one than the one published in their cookbook. It's great for parties, picnics, or potlucks. It will also freeze well (uncooked) for quick prep anytime!" Allow cheese to sit out until it is at room temperature. In a large bowl, mix together the cheese, butter and paprika using a pastry blender. Gradually mix in flour, first using the pastry blender, then using your hands. Mix until the dough pulls together. It should form a solid ball with a smooth appearance, but have a crumbly texture when pulled apart. If dough appears too dry, add more shredded cheese. Preheat the oven to 375 degrees F (190 degrees C). Pinch off a small piece of dough, and cover an olive with it. Roll gently between your palms to smooth and seal the olive inside the ball. Place onto an ungreased cookie sheet and repeat with remaining dough and olives. Place the tray of covered olives into the refrigerator for 10 minutes to firm up. Bake for 20 to 25 minutes in the preheated oven, or until browned. Serve hot or at room temperature. A fun li’l fritter of broccoli & cheese! 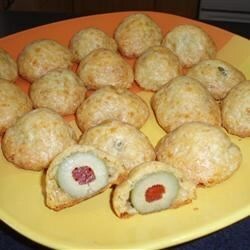 Roll dough around olives, and place in an airtight container, separating the olive balls with layers of waxed paper. To bake, do not thaw and place on an ungreased baking sheet. Bake for 25 minutes. I made this for alittle get together last night. I did add a few dashes of Tabasco. Everyone really enjoyed them. But watch out, the olives take awhile to cool...be careful on your first bite! I made this for Thanksgiving and everyone loved it!! I used 5 different kinds of cheese. Yellow sharp cheddar, white cheddar, monterary jack, american and mozzarella. These are delicious! I couldn't bake them fast enough at our christmas party. I made them the night before and froze them, then baked them in three batches -- terrific!